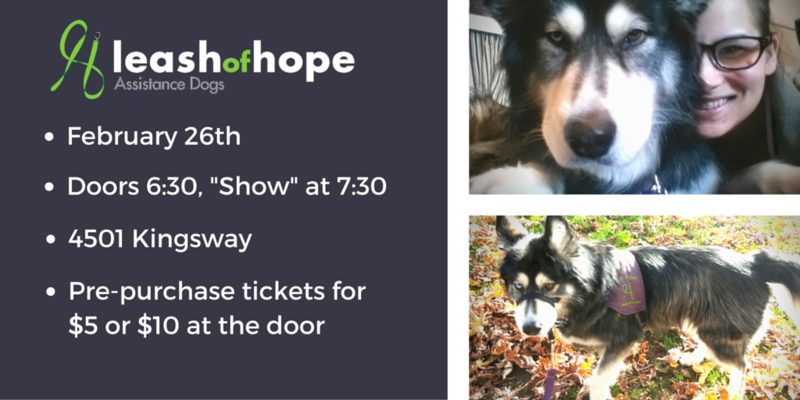 Join me and assistance-dog-in-training Sierra for a fundraiser showcase for Leash of Hope Assistance Dogs. This volunteer Society’s purpose is to train and provide assistance dogs for people with disabilities that are higher functioning and often slip through the system; thus resulting in receipt of little or no support. Leash Of Hope believes that assistance dogs can encourage and cultivate the independence of these incredible members of society by making their day-to-day lives a little easier.
) or $10 at the door. 6 months ago I was introduced to the most stunning dog I’ve ever seen. This wonderful Alaskan Malamute is basically my dream dog; wolfish features, two different coloured eyes, and the sweetest temperament. I’ve always wanted a dog like this, but with my disability I couldn’t dream of owning such a powerful dog for fear of a significant amount of road rash while the beast towed me all over town. However, I owe thanks to Leash of Hope for finding her for me and training her, not only incredibly well, but as an assistance dog. Leash of Hope Assistance Dogs – What they do. Leash of Hope is a start-up society that finds rescue dogs, re-trains them as assistance dogs, and then matches those dogs to peoples with disabilities. What makes Leash of Hope especially unique is not only their choice to find rescue dogs, but to provide their animals to peoples with disabilities that might otherwise be denied by the current societies in BC. They provide hope at both ends of the leash. There’s currently a large gap when it comes to providing assistance dogs to those who could use them, in large part due to the fact that there simply isn’t enough dogs in the current system to supply the demand. The current societies focus on the most acute cases. Leash of Hope is aiming to help alleviate this problem and bring hope to both rescue dogs, and deserving people who have been denied this benefit. 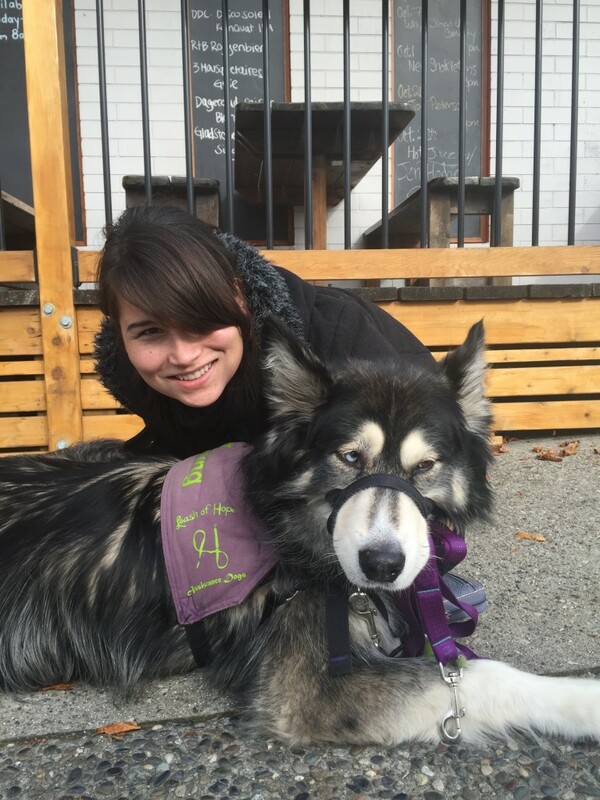 As an ambulatory quadriplegic I would not be approved for an assistance dog through the current societies, but Leash of Hope found my beautiful Sierra – who it seems was meant just for me. I struggle to put into words just how helpful Sierra has been for me. Sierra is classified as a stability and psychiatric dog through Leash of Hope’s classification system. I often fall down – due to a fun combination of natural klutziness and a body that can no longer quite keep up with my random attempts at street gymnastics – and Sierra’s strong body allows me to brace on her and help me back up off the ground, especially when I’ve hurt myself from the fall. She’s also learning to help be a ‘mobile banister’ for when I threaten to roll down stairs rather than take them the conventional way, and a bunch of other little tricks to help me in my daily life living with ambulatory quadriplegia. She’s considered a psychiatric dog as well, to help stave away the blues. I am genuinely amazed at how well she does this. I’m one of those unfortunate folks that suffer pretty brutally from SAD (Seasonal Affective Disorder). I get the winter blues pretty bad. This, however, is the first winter in a long, long time, that I’ve actually felt… alive… through the whole season. There’s not a day that goes by that I don’t laugh at her delicious goofiness or feel the warmth of her love, and this has done wonders for my soul. Unfortunately Leash of Hope’s dreams of continuing to find homes for rescues and help for those in need are being threatened by the new legislation put into place by our government effective January 18th, 2016. Although the new legislation will help in many ways, in an attempt to tighten regulations to reduce the number of fake assistance dogs out there, they’ve in fact made it all but impossible for a new society to start up. Public access has been firmly removed for any society not currently recognized by the government, but in order to get proper recognition and accreditation they must first raise $2200 and then spend a full year proving their dogs are properly trained and treated. The most challenging part, though, is that a new dog society must take their dogs into public places such as restaurants and movie theatres to prove that their dogs can handle it. Without prior training, i.e., access, this is a tall order to reasonably fill. It’s this Catch 22 that Leash of Hope currently faces.
. They will be starting a sticker campaign soon where businesses can place a sticker in their windows to show their support, and show Leash of Hope dog owners that they and their loving pooches are allowed in. I’m so grateful for Sierra; she brings me so much joy. And if you’d like to come meet my wolf lady, please don’t hesitate to drop by and visit us at the Personal Injury Resource Centre (PIRC) where she spends her days longing to find someone else she can give a bit of love to. Right now, I’m usually in end of week, in the afternoons of Thursday through Saturday’s. or by phone at 604-558-1954.